Apollo 14 launched in the late afternoon of January 31, 1971 on what was to be our third trip to the lunar surface. Five days later Alan Shepard and Edgar Mitchell walked on the Moon while Stuart Roosa, a former U.S. Forest Service smoke jumper, orbited above in the command module. Packed in small containers in Roosa's personal kit were hundreds of tree seeds, part of a joint NASA/USFS project. Upon return to Earth, the seeds were germinated by the Forest Service. 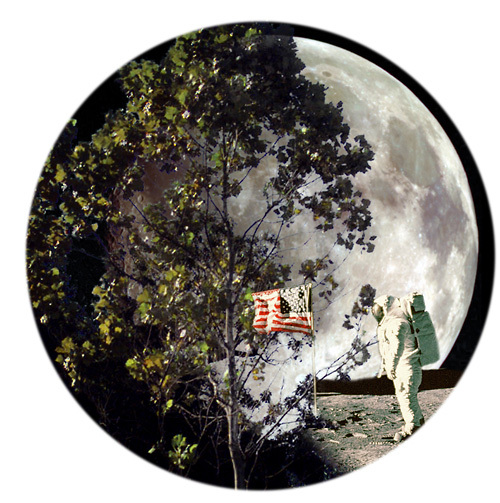 Known as the "Moon Trees", the resulting seedlings were planted throughout the United States (often as part of the nation's bicentennial in 1976) and the world. They stand as a tribute to astronaut Roosa and the Apollo program. The project began after Roosa was chosen for the Apollo 14 mission. Ed Cliff, Chief of the Forest Service, knew of Stuart Roosa from his days as a smoke jumper and contacted him about bringing seeds into space. 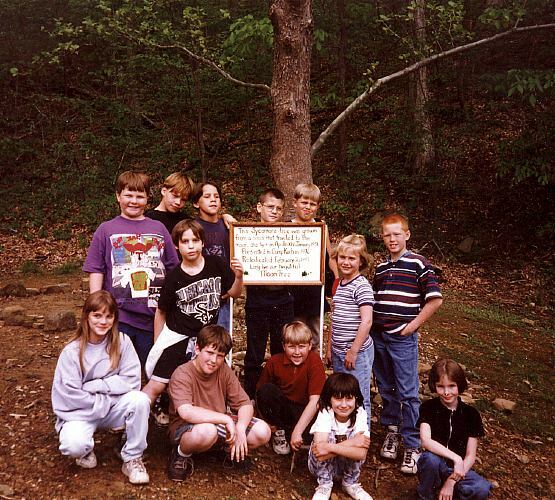 Stan Krugman of the Forest Service was put in charge of the project and selected the seeds for the experiment. Seeds were chosen from five different types of trees: Loblolly Pine, Sycamore, Sweetgum, Redwood, and Douglas Fir. The seeds were classified and sorted, and control seeds were kept on Earth for later comparison. Roosa carried about 400 - 500 seeds in his personal kit which stayed with him as he orbited the Moon in the command module "Kitty Hawk" in February, 1971. Unfortunately, the seed cannisters burst open during the decontamination procedures after their return to Earth, and the seeds got mixed together and were presumed to be no longer viable. Stan Krugman had the seeds sent to the southern Forest Service station in Gulfport, Mississippi and to the western station in Placerville, California to attempt germination. Surprisingly, nearly all the seeds germinated successfully, and the Forest Service had some 420 to 450 seedlings after a few years (some from cuttings). Some of these were planted with their earth-bound counterparts as controls, (as would be expected, after over twenty years there is no discernable difference) but most were given away in 1975 and 1976 to many state forestry organizations to be planted as part of the nation's bicentennial celebration. 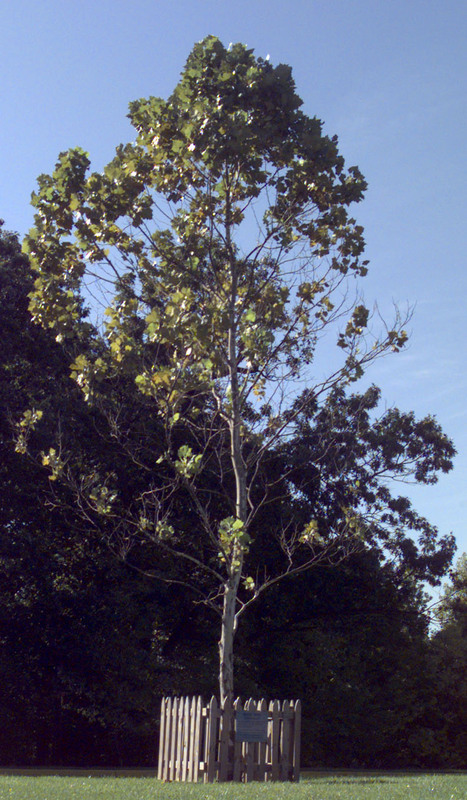 These trees were southern and western species, so not all states received trees. A Loblolly Pine was planted at the White House, and trees were planted in Brazil, Switzerland, and presented to the Emperor of Japan, among others. Trees have also been planted in Washington Square in Philadelphia, at Valley Forge, in the International Forest of Friendship, and at various universities and NASA centers. 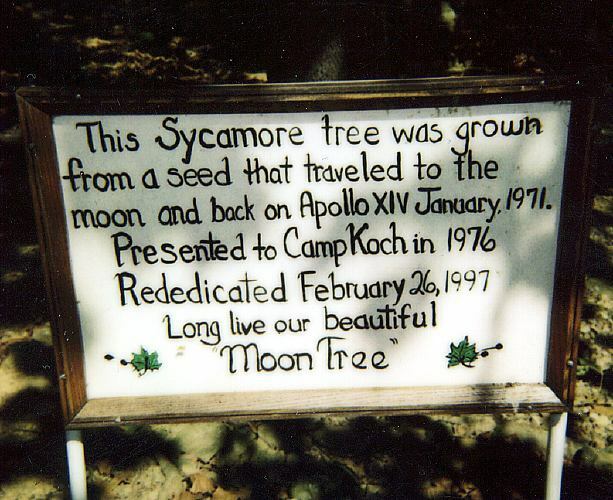 The Moon Tree shown at top left is a sycamore growing at Koch Girl Scout Camp in Cannelton, Indiana and at top right at Goddard Space Flight Center in Greenbelt, Maryland. 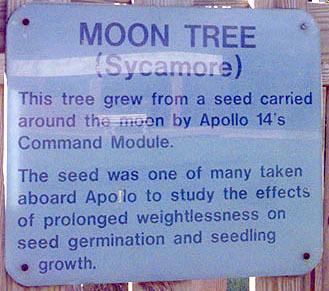 A list of Moon Tree locations can be found at the bottom of the page. Stuart Roosa was born on 16 August 1933, in Durango, Colorado. He worked for the Forest Service in the early 1950's as a smoke jumper fighting fires and later joined the Air Force and became a test pilot. He was one of 19 people selected for the astronaut class of 1966 and was part of the astronaut support crew for Apollo 9. 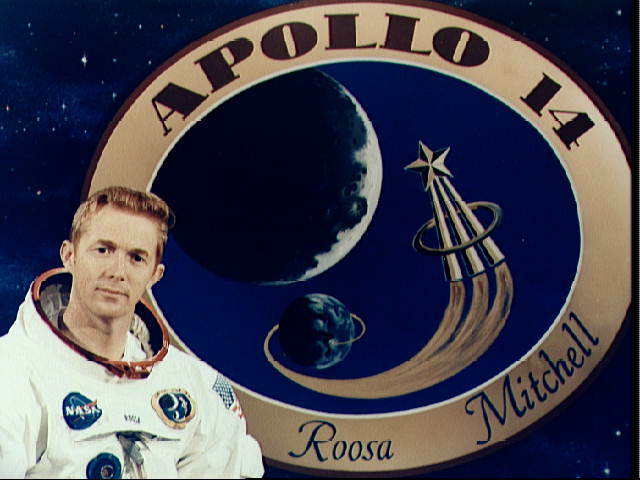 Following Apollo 14, Roosa was backup command module pilot for Apollo's 16 and 17. He then worked on the Space Shuttle program until his retirement as a Colonel in the Air Force in 1976, the time when many of his trees were being planted.